This is a knitted police box pattern based off the Tardis from the BBC show Doctor Who. It is knitted in the round with double pointed needles and is big enough to fit an iPhone (with a little wiggle room) or even an android. You'll need three different colors of yarn; blue, black, and white. You'll also need a darning needle to embroider the letters on it. There is an optional step that uses a size D (3.25mm) crochet hook, but can be done by casting on with your existing needles while knitting. Please note, this pattern is for personal use only. You may make as many as you would like for yourself or as gifts, but please don't sell then ANYWHERE. *While working the windows you can either carry the yarn across the back so it is loose, or if you want it to be less likely to catch on whatever you put inside the finished product I'd suggest you actually try to do something a bit different. Every time you knit a stitch with the white, bring your skein of blue yarn over your white and tuck the blue yarn between the knitted stitches and the white yarn coming out from the project. When you make your next white stitch bring the white yarn over and around the blue and then do your knit stitch like normal. It's time consuming, but if you do this though large color changes like the windows your blue yarn won't be dangly in the back of the work, it will actually be hidden from the front and "locked" securely to the wrong side of the work. **During the section of the black police box section, I only have the black in the front. Instead of cutting the yarn to switch between colors you will actually be working back and forth with the black and back and forth with the blue. Every time the two colors meet you'll want to do what I call "twisting the yarn." What you'll be doing is bringing one skein up over the other and then under, so your yarn coming away from the project will be twisted. Move that twist up against the project and then when you turn go ahead and work like normal. By twisting the two yarns together you are closing the gap between the knitted black section and the knitted blue section. If you wish to find alternate techninques or just different explinations, try looking up "intarsia in the round." With blue yarn, cast on 40 (optional: cast on one additional stitch and slip over very first st, tighten) join. I like splitting up the stitches 20 on the first needle, 10 st on second needle, and remaining 10 on the third. round 5: (K2, p6, k2, p6, k2) repeat once more. round 26: (k2 blue, k6 white, k2 blue, k6 white, k2 blue) repeat once. round 35: k1 blue, k16 black, going back to blue, turn and p19, twist your yarn**, turn. round 36: k20 blue, going back to black purl 16, twist yarn, turn. round 37: k16 black, turn, going back to blue p 19, twist yarn. row 41: k (k, pass stitch on the right over the left) twice, k 15, (pass last 2 st onto left needle and pass left st over right) two times. Turn. row 43: K,(K, pass right st over left) 4 more times, k 9, then from left to right pass the far left st over the one to it's right 5 times, leaving middle 4 st still active. Cut blue and weave in. row 44: with white knit in 4 active loops, turn. with blue: k (k, pass stitch on the right over the left) twice, k to end,(pass last two worked st to left needle and pass left st over right) twice. next row: p, (p, pass right st over left), repeat to end, finish off. Optional: On the back side, opposite the side with the light, using a crochet hook (US size D) draw up a loop about 5 st from right, chain 4, sl st in 4th st, finish off. This makes a little loop you can tuck the light on top through if you want to keep your phone super snug. If you don't want to make a crochet chain, you can make a small icord, say 4 stitches wide and 4 or 5 stitches long, then sew it on. Weave in all ends, turning piece inside out to get to any dangly bits inside. Sew up the bottom. You can even leave a hole big enough to plug your charger through it if you like. 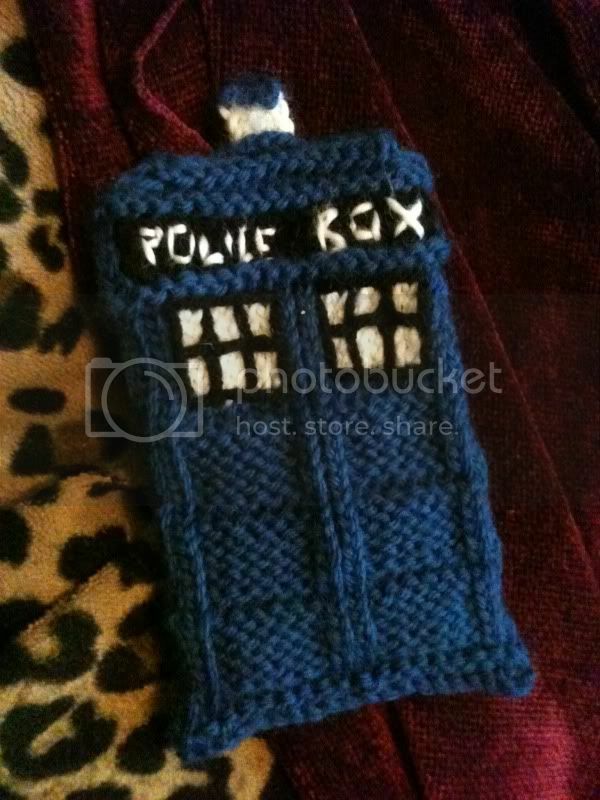 Embroider with yarn, I'd suggest for the "Police Box" lettering you only use 2 strands of your window white. You can use the black yarn normally for the window panes, but I'd suggest spitting it to 2 strands to embroider straight down the middle where the door meets. It makes a nice suggestion of a doorway without being too obvious. This pattern is for personal use only. You may make as many as you would like for yourself or as gifts, but please don't sell then ANYWHERE. This is lovely! Going to try and make one for the hubby! YAY, this is awesome. Thanks for sharing. =D I am going to make one for my dad for Christmas. Wow this is great! I love the 3D effect on it as well. May I link to this page on my blog too? Absolutely, link away. And thank you. I LOVE this! My daughter is a HUGE Whovian as well as several of her friends. This will be a great gift for all of them. I've already tried to knit it but I have to say, I'm totally confused by the pattern in the "police box" section where you work in intarsia. In round I can follow the k1 blue, k16 black, and then going back to blue. But then you "turn and p 19" then "twist your yarn, turn." This doesn't make sense to me. I assume when you say "turn" you mean turn the fabric so you are knitting from the wrong side. But if you turn with the blue at this point you will be knitting blue on top of the black that you just knit. Is this turn supposed to be here? The rest of it make sense. Please let me know if I'm missing something. You aren't the first with this question, I may have to make a video to explain what I mean since I have a hard time explaining exactly what I mean, I'll try though. You want to keep knitting blue on blue and black on black. When you "twist your yarn" you are simply crossing your blue and your black on the wrong side so that as you go back to working on blue and working on black there isn't a huge hole between the colors. Instead the two sections are locked together without having to be sewn together. I thought I would mention that think your directions for lines 27-31 are written wrong? It says to repeat line 28, did you mean 26? Sorry, I just wanted to clarify before I cast on! Thank you so much for your creativity, the pattern and any help you can provide. Ooops! You are right, it is repeat 26. I've fixed it. Thank you for pointing that out, no one has mentioned it before and even though I've gone over the pattern repeatedly I over looked it each time. No need to feel like that, let me explain. You aren't the first to need help, only the first to have asked. I've noticed on Ravelry a lot of people skip this decrease round, because they don't understand the purpose of it. This is a decrease done in a way that you get a sharper edge to the pedestal base. So purl the first stitch, then pass it over the loop to the left (decrease made, you should have gone from two active loops to one), then you purl that stitch and the next 16 stitches. At this point you have 17 purled stitches and 2 stitches left to be worked on your first needle. On those two unworked stitches, you want to pass the last one over the stitch to its right leaving one stitch which you purl. All that is then repeated for the last 20st on the remaining two needles for a final st count of 36 active loops. Okay I'm a little bit confused about round 35?? In the beginning of this round you state that we need to k1 blue and then k16 black.... but at the end of the first two steps I'm left with one unworked stitch on my left hand needle? What am I supposed to do with that unworked stitch do I k1 again and then begin the next step that is stated here "going back to blue, turn and p19, twist your yarn**, turn."?? I'm sorry it's taken me so long to reply, I've been trying to work up a Tardis to show you with. I just didn't realize how hard it is to get even a quick project done with a toddler. As to the unworked stitch, you can slip it with the other blue stitches if you like, or you can slip it onto the needles with your black stitches. After working the 16 black stitches, you pick up your blue and work across the back and end up working that stitch you are worried about. My goal is to have my husband help me make a video later today that I can post. I've been wanting to do that for a long time, but this would be a great round to record since it doesn't follow the average way of thinking while knitting. Any luck with that video for row 35? I'm trying to follow the instructions and your comments above, and sometimes I think I get it, and then I go to try it and it doesn't make sense anymore. I loved your video for row 2. Very helpful. Thanks for the pattern!! You know what, I think I understand it now. I had an epiphany. I was trying to think it out before I started because I'm not very good at ripping my knitting out to fix a mistake. I forgot that when you switch colors on row 35, you have to go back to where you left that color. It's not going to be where you ended the first color. It all makes sense now, thanks again for the pattern! I am so sorry I didn't see your comment until just this minute. I'm glad you figured it out though. I still haven't gotten around to making that video. I tried a couple of times to do it by myself, but without a tripod, I was holding my phone between my knees and trying to knit at the same time. ...Yah, it didn't work out too well. It's still on my to do list of things to make though. It means you physically turn your work around. Where you were looking at the right side of the work, you turn it around and look at the wrong side. Once you've turned your work, you then start working like normal. Often with pieces like this all (or most) of the stitches while working on the right side will be knit stitches and then when you turn it, you work purl stitches. This way all your stitches look the same when you look at the outside (or right side) of the project. Does that help? If not, you can Google "what does turn mean in knitting" and not only find other people giving (perhaps) better definitions but also videos. I've found that watching videos on YouTube has done wonders for figuring out what new terminology for knitting and crochet are. Even if the first one doesn't help me, I can usually find 2 more that do.